Parents, can you relate to the following conversation? While most parents are genuinely interested in their child’s life, a typical pre-teen or teen may perceive these types of questions as probing or interrogation, thus resulting in very brief answers. They may also be perceived as an ulterior motive to get to something more personal or sensitive in nature. If you think about it, the nature of the above questions, which we have all asked as parents, is quite vague. When you ask a child what he/she learned during the day, there are so many possible responses to choose from that the easy route is to simply say, “Nothing.” The end result is often hurt feelings on the part of the parent and a further push for independence (or space) on the part of the pre-teen or teen. I have a simple solution to this common disconnect. Try changing the questions you ask. Ask questions that are child driven, not parent driven. 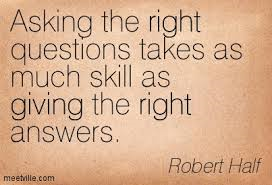 Ask questions that allow your child to own their response and in doing so, feel a sense of pride as they answer. Below are three possible questions you might ask that will hopefully provoke a much different response. Not only are you giving them an opportunity to provide a more specific answer, you are also modeling how to accentuate the positive. Don’t worry if their answer has nothing to do with academics. Remember, the purpose of your question is not to probe your way into something deeper, it’s simply a chance for them to own and celebrate a highlight of their day. I’ve always believed in providing students with frequent opportunities to “teach to learn”. When you allow your child to teach you, there are countless benefits for everyone involved. Aside from the child benefitting from actively reinforcing or relearning specific content, you are able to model curiosity and creativity, both of which are critical skills for lifelong learning. So often our questions around academics have to do with the result, which in most cases is a letter grade or percentage. I wrote a previous blog about the dangers of praising only the result (click here). By asking about a feeling such as confidence, you are essentially allowing your child to reflect on the process that led up to the test (i.e. studying). Whether or not the conversation continues and you are able to address some of the issues you may see with regard to studying, you have at least planted a seed of self-reflection. While these questions aren’t necessarily going to guarantee improved communication between you and your child, it’s a great place to start. I invite you to share a question in the comments section below, which you feel would be empowering in nature and may provoke an alternative response.